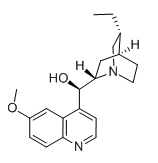 Hydroquinine is an organic compound and as a cinchona alkaloid closely related to quinine. AUT1 is a novel specific, cell permeant modulator of Kv3 channels with EC50 of 4.7 and 4.9 uM for Kv3.1b and Kv3.2a, respectively. Revaprazan Hydrochloride is a drug that reduces gastric acid secretion which is used for the treatment of gastritis. Glibornuride is a blocker of adenosine 5'-triphosphate (ATP)-sensitive K+ channels (KATP channels). Halofantrine has been shown to preferentially block open and inactivated HERG channels leading to some degree of cardiotoxicity. Glibenclamide is a sulfonylurea compound that modulates insulin production. ML297 is a selective Kir3.1/3.2 (GIRK1/2) channel activator (IC50 values are 160, 887 and 914 nM for GIRK1/2, GIRK1/4 and GIRK1/3 respectively). Nigericin sodium salt is an antibiotic from Streptomyces hygroscopicus that works by acting as an H+, K+, and Pb2+ ionophore.